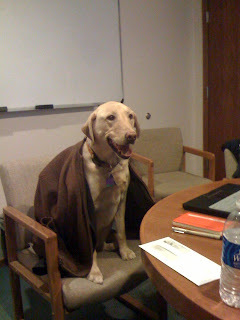 Nanette's in Michigan for a few days visiting family, so our dog, Quincy, got to come with me to work today. This afternoon, I was in a meeting with the iggli bloggers. I looked away for a few moments, and the next thing I knew Quincy was running the friggin' meeting. A Wegman-esque moment . . .